You can feel safe and secure carrying your baby even for prolonged periods as it maintains your baby's natural posture, preventing your baby's legs from opening out excessively. The presence of pores to allow the circulation of air also ensures that your baby is cool, comfortable and does not pespire easily. As the piggy back harness provides a firm support for the baby's body, you feel safe and secure even when carrying your baby by piggy-back. It can also be used when cradling and carrying your baby. Shields the baby from the glare of the sun and from the wind, and maintains the posture of the baby's neck while the baby is asleep. Made of material that is easy on the skin and with superior sweat-absorbent properties. With the drool pad, cleaning is now made easy. The area around the baby's face is always kept clean.et. The baby carrier, with the waist belt included, designed to fit the body and does not tire you out easily when you are carrying your baby. 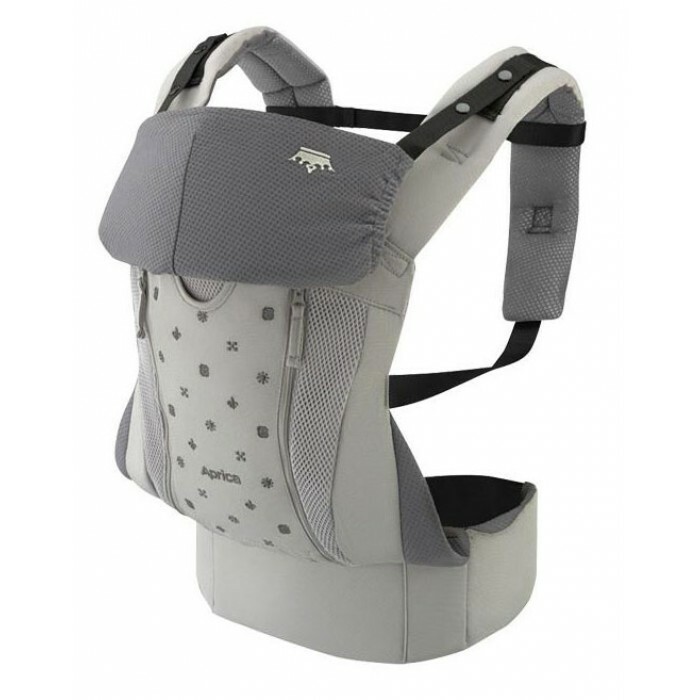 Four-directional shouldering; Change the way of carrier according to baby's age and body build. Apply ancillary hand supporting when holding baby horizontally to better stabilize the baby's head. Plus Aprica's unique design, to hold the baby by hand from where his two legs separate to effectively prevent its thigh joint from dislocation. The cover on the top of the head is standing upright. Special soft material and the style design aimed to completely protect the baby whose neck is not yet fully developed. When the upright holding position not in use, it can be folded back. Easy and simple. Broad height and width design at the rear head part, using special soft materials to allow baby's vital rear head part to have the best sense of touch. When horizontal holding period has passed as baby grows, the soft backrest can be removed to change to proper holding position. 3-D ventilation mesh material; The parts that contact the skin of the baby are made of breathable fluffy netted materials so that it ensures coolness in summer. Healthy material easy to clean and fast to dry.